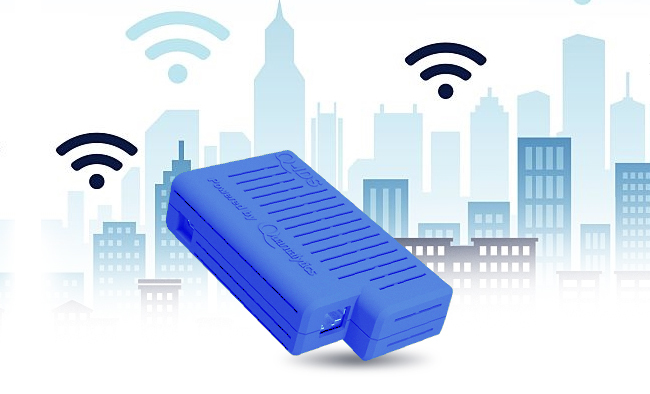 The Q-WiFi® is an amalgamation of a number of open source software packages running on an extremely ultra small form factor, low-power-consumption network appliance designed to detect and thwart “Evil Twin” Wireless Access Points (WAPs) and decoy WiFi routers. The Q-WiFi prevents Evil Twin APs from tricking users while also monitoring network devices and services, and provides intrusion detection and prevention. The provided WiFi protection includes actively blocking the “Evil Twin” upon its detection by unleashing a Denial of Service (“DoS”) attack to prevent users from logging into it. The ultra compact design allows exceptionally flexible and creative deployment options as well as significant electricity and space savings. EvilAP_Defender is the leading open source, enterprise-class tool to discover and prevent Evil Twin Access Points (APs) from attacking wireless users. The Q-WiFi can discover and provide an email alert when an Evil Twin is discovered. In addition, it can perform a Denial of Service (“DoS”) attack to prevent the legitimate WiFi users from connecting to the Evil Twin AP. This can give network administrators and/or law enforcement time to locate and remove the Evil Twin AP. N.B. The DoS feature only works if the Evil Twin and legitimate AP have the same SSID but different BSSID, or is running on a different channel. (The BSSID – Basic Service Set Identifier - is the AP’s MAC address.) This prevents accidently crippling a legitimate AP. Whitelisting is done via a wizard during installation in order to recognize and allow legitimate Wireless Access Points (APs). Aircrack-ng allows the Q-WiFi to capture and monitor WiFi traffic. Aircrack-ng feeds this data to EvilAP_Defender. qAircrack-ng is the web-based GUI for Aircrack-ng. ModSecurity® (“ModSec”) is the leading open source cross-scripting attack protection package in order to harden the Q-WiFi’s built-in Apache web server and prevent conceivable attacks. THP helps defend the Q-WiFi by fooling attackers, making it appear that the attack is working, while meanwhile logging the attack info. THP wastes an attacker’s time, and creates an opportunity to detect the network intrusion by offering to the hacker what appears to be thousands of services. HA Proxy is the leading open source package for automatic failover and load balancing. Up to 32 Q-WiFi network appliances may be linked for automatic failover or load balancing for coverage of extremely large networks. Administration is done through a web gui. Webmin is the leading open source Web GUI package for server configuration and maintenance. Webmin also allows for the linkage of multiple Q-WiFi systems for simplified administration. Click on the video below to see what NBC's Jeff Rossen has to say about protecting your portables on public networks! The Q-WiFi is completely administered through a Web GUI. This makes all features easily available even to novice network administrators. No Command Line Interface (CLI) or Linux skill is required. The Q-WiFi has both a 1000 mbps (gigabit) NIC and 802.11 b/g/n WiFi. The Q-WiFi is intended to be deployed wherever there is a risk of an Evil Twin attack. E.G. Public spaces where free WiFi is offered, in addition to private WiFi networks. Notifications are provided by e-mail using SendMail, which is configured with a module in Webmin, and syslog entries. The Q-WiFi network appliance can be integrated with Nagios on the Q-Box® as another notification route. SMS notification is available as an option. The Q-WiFi network appliance can also be integrated with the Q-Log® network appliance or any other Syslog or SIEM solution. Q-WiFi® and all registered trademarks are property of their respective owner(s).